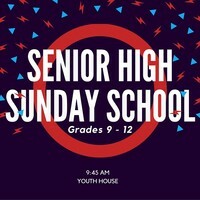 Come Join our Senior High Pathfinders class! This class is open to all students in high school, grades 9-12. This year's Pathfinders Senior High classis currently studying the book of Proverbs. The leader will bring discussion topics and questions each week. We will address and discuss any issue raised by the students as well.